Read our Basics Articles before attempting these firing schedules. You need to understand Coefficient of Expansion, Annealing and other basic glass vocabulary terms and concepts before you attempt to make and fire your glass masterpiece. Below are various firing schedules for you for your glass projects. Keep in mind, and this is very important - you need to know your kiln. Does it fire hot? Does it fire cool? Is one side hotter than the other side? Is the bottom cooler than the top? How will you know this? By doing several test fires in your new kiln, by always doing a new test fire if you are changing the size of a project or the layers of glass, the look you want to achieve and/or the layers of the project. The key to being happy with your masterpiece is to do a test fire first with less expensive glass. Suggested Target Temperatures below are for a kiln that is firing perfectly - and that rarely happens. Be prepared to have to adjust up or down from these Target Temps, based on how your Test Pieces come out of the kiln. The below schedules are for digital glass kilns that have lid (or embedded lid) elements and can do ramp segment firings. These firing schedules are divided into categories - we are giving you Target Temperatures for different effects - Tack Fuse, Contour Fuse, Full Fuse and Slump. You need to know which effect you want first. Then take into consideration the layers of your project. A general rule for a Full Fuse is at least 2 even layers. You can choose Tack Fuse or Contour Fuse IF you are only using one layer and some decorative elements on top of the base layer. Slumping is ALWAYS done AFTER the Fuse firing. Do not attempt to Slump until you have done your Fuse Firing. So know the effect you want - THEN see the below schedules based on the size of your project. You can fire faster for small projects, but you must fire slower the larger the project. You must also anneal longer the larger the project. Here are some pictures of the different Fuse Effects and Slump Effects. the RAMP HOLD feature of your particular kiln. after you program it in, you will typically see FULL on your controller. - 500 per hour to 1150 - hold 10 minutes. - 9999 to Target Temp - hold 12 minutes. - 9999 to 960 - hold 15 minutes. Do not open kiln until 100 degrees or lower. and Slumping schedules we have outlined here on this page. Bubble Squeeze - Notice on all of the above schedules that we stop and hold at around 1150 degrees. This is called the Bubble Squeeze part of the firing schedule. Glass will begin the softening part of the process around this temperature and we hold here to allow air to escape before the sides of the piece seal. 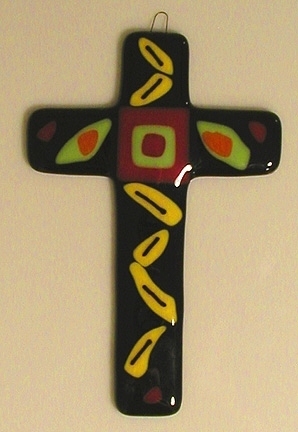 The bigger the piece, notice the longer hold time during the fusing firing schedule. Also, once the pieces are 6 x 6 and larger, we add an additional Bubble Squeeze. For Slumping - You can use the above schedules, as well. Note that your Target Temperature will change to 1250. Also, you only need to hold at 1150 for about 5 - 10 minutes. During the fusing, the sides sealed, so no need to hold for longer periods for the Bubble Squeeze. Another segment that will change is the hold time once you get to Target Temperature. Notice above, for the Fusing Firing, it is almost always 12 minutes. But when Slumping, the hold time will be determined by the mold and the size of the piece and the desired effect. Some molds will only require a Hold of 15 minutes, such as the GM01 Small Square Sushi Mold. But the GM02 6” Square Sushi needs 20 minutes Hold time once it gets to 1250 degrees. Some Draping may take 20 minutes or more. Some Drop molds may take 30-45 minutes. So, you need to experiment and find what works for you, your kiln, your mold, size of piece and desired effect. These Firing Schedules above are good basic schedules. 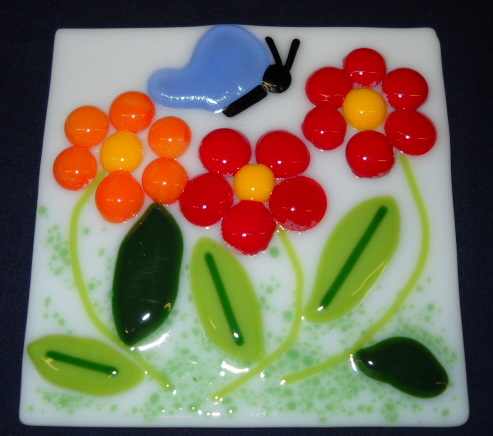 Out on the Internet on different glass web sites and in different glass books by different authors, you will find many more and different Glass Firing Schedules. Bullseye, COE90, has as many as 8 segments in their basic firing schedules. You can start here with our above suggestions - they have worked great for us. 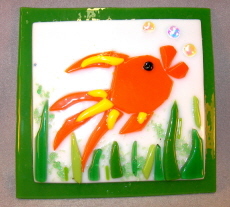 But realize, you may want to seek and find your own that work best for your own projects depending on kind of glass, size of project, kind of molds and desired effects - and the kiln you are using.